These eggnog cranberry orange muffins might just be the best muffins I have ever made. In fact, my husband said exactly that after he inhaled one in record time. He may have been really, really hungry – but whatever, they are amazing so I’m going to believe him! Of course, they may just be the least healthy muffins I’ve ever made too, which could have something to do with it, but they’re healthier then everything else I’ve shared over the last couple weeks so I’m just going to go ahead and say these would make a great Christmas morning breakfast. Or snack. Or just to have this afternoon because they are so wonderful. There’s so many great flavours going on here. 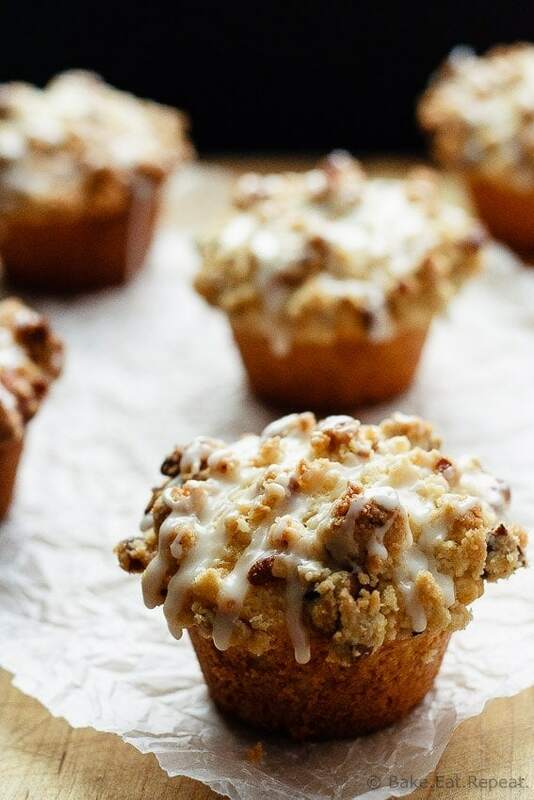 Eggnog is used in the muffin batter instead of buttermilk, fresh cranberries and orange zest are in the muffins, and a brown sugar pecan streusel with an orange glaze finishes them off. That’s a fantastic muffin. Very bakery like. Not really the kind of muffin I typically make. 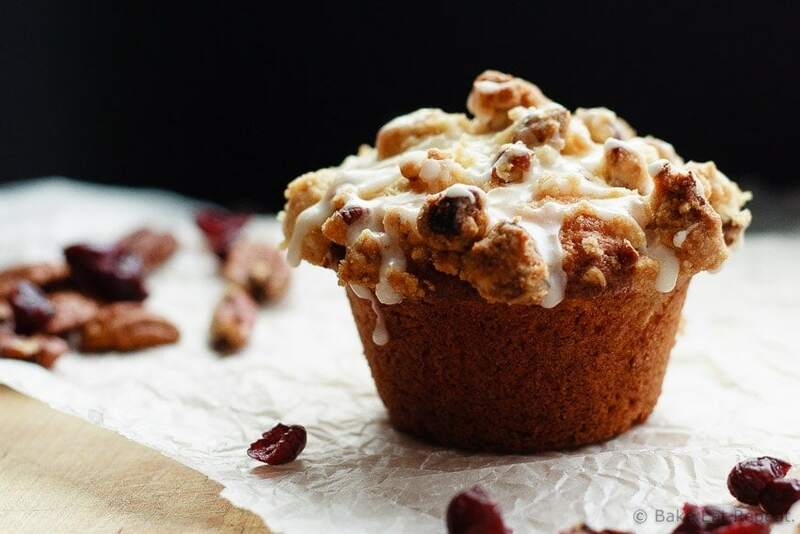 Sadly, these cranberry orange muffins may have convinced me to start making bakery style muffins a little more often, rather then the ultra healthy ones like these or these. Although, I say that now. In December. Amidst all the treats. I will likely change my tune in January. When all the treats need to stop and we need to get healthy again. But for now – eggnog cranberry orange muffins that aren’t that healthy, but are pretty freaking awesome. Christmas morning breakfast anyone? Tender, flavourful, amazing eggnog cranberry orange muffins with a crumb topping and an orange glaze - perfect for your Christmas breakfast plans! Make the streusel - in a small bowl, combine the sugar, brown sugar, flour, chopped pecans and salt. Drizzle the melted butter over everything and stir until everything is combined and clumping together. Set aside. In a small bowl, toss the cranberries and orange zest with the 1 tablespoon of granulated sugar. Set aside. In a large bowl, whisk together the flour, baking powder and salt. In another bowl, whisk together the remaining 3/4 cup sugar, eggs, melted butter and oil until well combined. Add the eggnog and vanilla and whisk until combined. Add this mixture to the flour mixture and stir until just combined. Fold in the cranberries. Scoop the muffin batter into the prepared muffin tin, dividing it between the 12 muffin cups. They should be almost full. Top the muffins with streusel, dividing the streusel mixture between the 12 muffin cups. Bake for 17-20 minutes, or until a toothpick inserted in the center of a muffin comes out clean. Allow the muffins to cool for 5-10 minutes in the muffin tin, and then remove them to a wire rack to cool completely. In a small bowl, whisk together the powdered sugar and orange juice until smooth to make the glaze. Drizzle the glaze over top of the cooled muffins. Note: I think that dried cranberries would work very well in these too if you prefer, although we enjoyed the tartness of the fresh ones. Just omit tossing the cranberries with a tablespoon of sugar if you go that route. These are the best muffins I have ever made or eaten. I skipped the nuts and the glaze, coarsely chopped the cranberries. Gave several to friends, received many rave reviews. Thanks for sharing. I'm so glad you liked them Jean! Thanks for letting me know! What a delicious combination of flavors! Can't wait to try these out soon! I was down to my last glass of eggnog and found this in my email. all I can say is WOW, they are the mega muffin I have been looking for. Run a B&B having 8 for breakfast for 3 days, they will love these, didn't put the streusel or the glaze on them, hey, trying to be healthy! Yeah next time I'll leave off the streusel and glaze to make them a bit healthier, but for a treat they were pretty fantastic with both! :) Glad you loved them! The best-tasting food doesn't have to be the healthiest. Hey, tis the season and all. These are so tall and fluffy, too! These sound AMAZING - love all those yummy flavors :) I can totally see how these were the best you ever made! 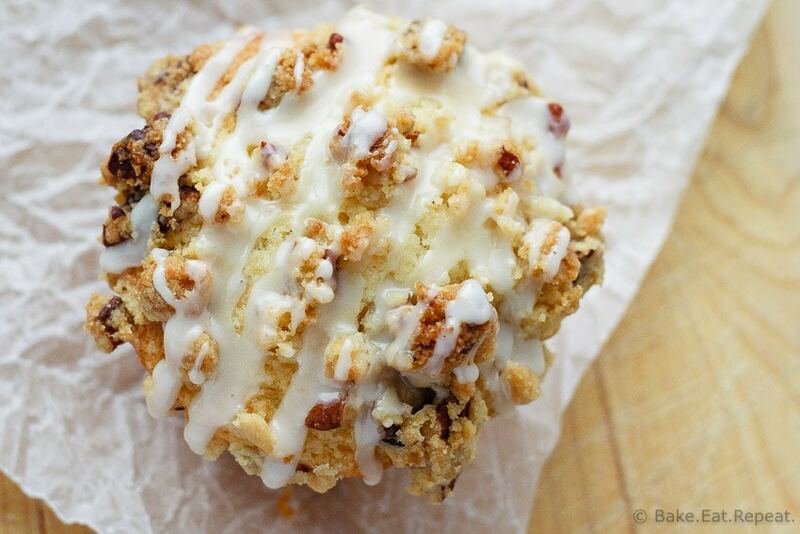 These muffins are gorgeous! Packed with my favorite seasonal flavors! Pinning! These muffins look so delicious, Stacey! I love baking with eggnog -- it adds so much moistness and flavor. And cranberry orange is one of my very favorite combinations! These muffins sound wonderful, Stacey! I love any excuse to use eggnog in baked goods. Cranberry and orange is such a classic combination. I bet it is fantastic with the eggnog. Gah! What a great way to get more eggnog in my life. Yum. Oh these muffins looks gorgeous, Stacey! I love using eggnog in just about any type of baked goods. The combination of cranberries and orange sound delicious, too...especially with that glaze! What a perfect holiday breakfast!